Well, this comes as a surprise to no one – Apple just announced the iPhone 5c. It's the more affordable of the two iPhones that debuted today. 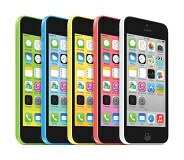 The smartphone lived up to the numerous leaks, combining iPhone 5 internals with a plastic outer shell that comes in a number of bright colors. Here come the specs – a 4" Retina display with the same resolution (640 x 1136 pixels), Apple A6 chipset (same as iPhone 5) running iOS 7, 8MP / 1080p camera, 100Mbps LTE connectivity, Wi-Fi a/b/g/n, Bluetooth 4.0. The iPhone 5c is thicker than the iPhone 5 - 9mm vs. 7.6mm - and heavier - 132g vs. 112g. Also, instead of aluminum it is made of hard-coated polycarbonate. It will come in five color options: White, Blue, Green, Yellow and Pink. It will be available for pre-order on September 13 and cost $99 for the 16GB and $199 for the 32GB, both on a 2-year contract. It will launch on September 20 in the US, China, the UK, Australia, Canada, France, Germany, Japan and Singapore. By December the availability will be expanded to more than 100 countries. That's how much the iPhone 5 would have cost if Apple kept to its usual strategy of selling last year's model at a $100 discount. And it would have had a metal back and slimmer, lighter body. By the way there will be colorful cases available for the iPhone 5c, going for $30 each.